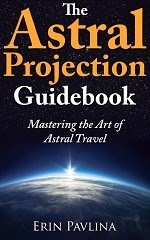 This book review is about The Astral Projection Guidebook: Mastering the Art of Astral Travel by Erin Pavlina. This book is similar to the previous book I reviewed, (Astral Projection, by Sylvia Jacobs.) Both authors approach this using the same basic "classical" occult assumptions: that you have an astral body that actually projects to another plane of existence. Both authors give practical advice on leaving the body. However, I enjoyed this book a lot more than Sylvia Jacobs' book. There are several reasons for that. First, although both books are relatively short (142 pages for this one versus 114 for the other) Pavlina's book uses a smaller font, so you're getting more than twice the content. Second, she gave a bunch of background story: she wrote about how back in high school, she and her friends (Ashley and Jared) discovered lucid dreaming and OBEs and learned to cultivate their abilities. She talks about their discoveries, adventures and the setbacks. The trio would rendezvous, sometimes pulling each other out-of-body, and go on adventures. She doesn't expound on any scientific experiments they could have done (that would have made the book better), but there's a real human side to the book. "So if you ever wake up in your bed, are paralyzed, but can still see, you are golden! Get ready." Many people are scared to death when they encounter sleep paralysis. Pavlina sees it as a golden opportunity for adventure (as do I)! She changes the fear to opportunity. Third, she addresses the reader like her best friend: up-close, personal and with fun, whereas Sylvia Jacobs wrote like she was addressing a classroom: a little dry and clinical. "...But not you. You're reading this guide book so when sleep paralysis happens to you, you're going to be thinking, "Wait, what's this now? I can't move but I feel wide awake? Oh wow, this is it. This is awesome. Hey, who are you hovering over me? Be gone foul creature, I have work to do!" "If you rail against the fear, it will take hold of you and you'll sink into the fear vibration which will make you an easy target and a tasty snack." Although there's a serious side to the discussion of negative entities, she always maintains an upbeat attitude. This has two very important purposes: First, anyone who isn't confident (or scared) will probably back off and think twice before dabbling, at least until they conquer their fears (as well they should). Second, someone who take this to heart learns the confidence they need to have positive experiences: As author Frank Herbert once wrote in the book Dune, fear is the mind killer. If you go into this with a fearless, almost playful attitude of exploration, you'll have positive experiences. And even if you do encounter negative entities, your own fearlessness will allow you to safely confront potential threats and get beyond them, rather than letting them conquer you (drain your energy or use your fear to control you). You can avoid almost all of the negative encounters by maintaining that upbeat attitude, which raises your vibrations. I have to be honest with you: there were a few places in this book where I did not agree with the author. First, she insists that we do not leave our bodies every night during sleep. I disagree. In my experience, we do, but we're normally unconscious and unaware that it's happening. Most OBE authors agree with me on this point; Pavlina is one of the rare exceptions. Don't succumb to the pull. Keep going. It doesn't hurt to send reassuring thoughts of calmness to your body. "Shh, there there, it's all right, I'm not leaving you for good, just want to step out for a minute and get some air. There's a good body, just stay here, and I'll be right back." Stay calm and in control. Despite these few points of contention, I did agree with most of what she said. She has hands down one of the most thorough discussions of negative entities and how to handle them. She describes several levels of protection, just in case one method doesn't work for some reason. Having said that, there's a negative side to this. Many books treat negative entities with a bit more spiritual, love-oriented care. Ali Wylie's book comes to mind here. Pavlina often takes a different approach: once she figured out how to deal with negative or "dark" entities, she became a bit vindictive, purposely seeking out negative entities and cutting them down or stabbing them with a light-sword. She eventually grew out of this childish phase (and that's all discussed), but it casts a somewhat un-spiritual light on the whole thing. If you're looking for a book with deep spiritual meaning, you'd be better off reading Jurgen Ziewe's first book. Still, the information is good and, as I said, very entertaining. If you achieve separation by rolling out of your body, you'll want to be careful not to continue your descent into your floor and then possibly the ground. It's disconcerting to project and find yourself immediately encased in tons of earth. Undoubtedly! This book has some excellent advice for preparation and execution, but it's is a bit short on the OBE techniques themselves. Sylvia Jacobs' book is better in that department. This book is very well written, has excellent grammar and perfect spelling. I only found one or two typos. Although it's apparently self-published (the cover says www.gopublished.com), it looks and feels very professional. She obviously took a lot of time and care making it the best book it could be. This book is not very innovative, but it is highly entertaining and very informative. Thumbs up. I enjoyed the review. It sounds like a fun book to read. I went to her web site and she has a lot of articles and info on there. Looks like some interesting reading. Thanks for the review!